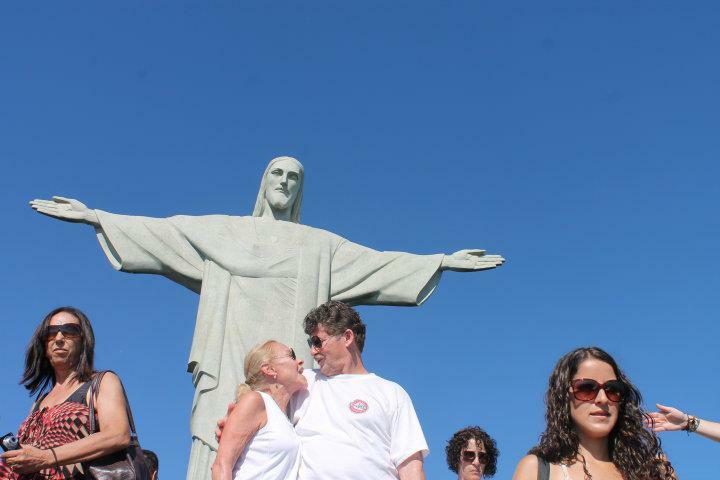 Christ the Redeemer (Corcovado), Rio - January 18, 2015 - Blog from Rio de Janeiro, Brazil | South America!! We walked the beach at sunrise. We were there before 6 am. Many, many people were on the beach already to not only to witness the sunrise but probably more importantly to stake out a spot on the beach for the all-day Sunday family picnic. We were amazed to see so many people on the beach so early in the morning - at first we thought perhaps they spent the night; after all, the beaches are lighted at night. Whole families including babies and grandma and grandpa from outlying areas two and three hours away grab an early morning tour bus and arrive with umbrellas, baby strollers, blankets and picnic goods to spend the day at the beach. I still believe some of them did spend the night - party then sleep on the beach. Our driver Renato, picked us up just as he said he would, before 8 am. He wanted to get an early start since cruise ships were in port and our destination is also a top draw for cruise excursions. We headed immediately to Corcovado and the cogwheel rail that took us to the top of the mountain. Along the way, he gave us a history lesson about the treaty between Spain and Portugal, signed in the 1498 in the Vatican, that assured, in an extremely abbreviated version, meant that the two countries would share ownership of any new world discovered below the equator. When South America was discovered, Portugal got the Atlantic side and Spain the Pacific, thus that's why Portuguese is spoken in Brazil and Spanish in the rest of South America. Renato also gave us information on the building of the great statue, Christ the Redeemer, and the railway leading to it. An interesting point is that the mountain on which Christ the Redeemer sits was originally called The Pinnacle of Temptation. The name was later changed to Corcovado meaning hunchback. Christ the Redeemer was erected as a symbol of protection for Rio de Janeiro (River of January . . . I was wondering, could it be that my name, Janie, is some derivative of January???). The railway ride through the rain forest national park to the top of the mountain was pleasant with occasional views to the city below. We saw mango and jack fruit planted by Dom Pietro II (Brazil's second emperor) and many tropical plants that we hold dear as expensive houseplants back home along the way. At the top, we were 2300 feet above Rio. Oh my God, the view from Corcovado was amazing - it is almost unearthly. A ring of small mountains that appear as islands rising out of the water sit in a haze and almost circle the bay. Between this ring of islands, there is only one channel in for ships. I simply don't have the capacity to justly describe the view and I am sure the photos might not reflect the glory that is there as well. Stan says our visit to Sugarloaf, the queen of all the mounts, will provide even better views tomorrow. Perhaps I can be more descriptive then. And maybe I'll become better educated and know more about what I am talking about. We are learning. The statue is really something - It is 90 feet tall sitting on a 25 foot base (which houses a small chapel) and there is a full 75 feet between the hands. It is a stark and moving sight. There is no way to describe the crowds at the foot of Christ the Redeemer. People, people everywhere—even at 9 am! And every single person wants their photo taken in front of the statue with arms out-stretched like the Christo. You will see from our photos that we could not resist either. Next Renato drove us through old town and to new town, the financial district. Rio is a mix of old and new, mostly because of corruption, revolutions, lazy government, then the more corruption and more revolution. Still it is a huge and beautiful city with 8 million residents—pretty much all on top of each other. For many years, cable cars and trains were the primary mode of transportation. Streets were small. Then Volkswagen came and delivered cheap cars. Roads and streets throughout the city were rebuilt as multi-lane avenues to support the heavy influence of cars. The 2016 Olympics is changing that. Rio's subway system, much like MARTA, is being expanded. Six new stations are currently under construction and a cable-car system is being added so that residents and tourists can take a train into the city and view all the famous city spots via cable car. Won't that be lovely? We visited Sao Sabastian Cathedral which is a relatively new landmark for Rio. This huge cathedral was built in the fashion of a pyramid and is designed so as to have natural interior lighting and natural air conditioning. It has room for 5,000 seated people. We were blessed to be there during Sunday morning mass. One of the most interesting things we saw today was the Carnival Parade route. Actually parades take place all over the city during Carnival season but there is only one premier parade. Here, this special parade takes place on the night before the first day of Lent but it is in a "stadium." Imagine not an oval or round stadium but a street with stadium seating, complete with corporate boxes, lining the way. This street-like stadium is probably a half mile long. Renato dropped us off near the Ipanema flea market. He also recommended an authentic Brazilian food restaurant, Casa de Feijoada (name means black beans and rice). He said it was a great place for a special lunch. We were a little hungry so we took his advice. Oh boy, it was a whole lot more than beans and rice. Yes, we had the black beans and rice--some of the best we have ever, ever eaten, but in addition we had some little alcoholic fruit drinks - the kind that knock your socks off and a lot of food! We had collard greens (chiffonade style), fried lard (pork rinds, if your will) deep fried manioc (yucca), jerk beef, fresh sausage, spicy sausage, ribs, and pork loin all in a bean broth. Oh, it was heavy, but it was completely delicioso!! After lunch, we finally made it to the flea market. All of you who really know me know I love markets!! This was a nice one. It had no fruit or vegetables but it had leather, art, clothing and . . . it had HATS! I bought one! No more ball caps with skirts! No mas! Ipanema Flea Market is on Ipanema Beach; Ipanema Beach is next door to Copacabana Beach. Since we enjoy walking and getting close to local people, we decided to walk back to our hotel in Copacabana and to also make a small detour to find the super market we discovered late yesterday that seemed to have better selection and better prices for water (you must buy bottled water here) and wine. Oh boy, everything looks alike here. Two hours and a great, circular and hot walk later, with a little help from a friendly local, we finally arrived at that store, made our purchases and found our way back to the hotel. Today we vowed to make sure our map is with us on every single future walking adventure. Becky Larring Love the read! You make it like we were there with you. The history was great. Love you guys! Mary Janie, if you keep this up, I may have to retire NOW and hop on a plane to join you!! !